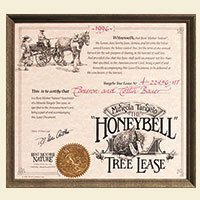 Give someone honeybells from their own leased tree in FL. The word on the Honeybells was that they were really refreshing in the depths of winter – so sweet. The wonderful fruit was given to us as a gift from my new daughter-in-law. I also loved the newsletters. I don’t know where to begin to thank you for your professionalism and customer service! Thank you for your pristine follow up… Its unheard of these days. I look forward to continued business with you… The fruit was delicious.